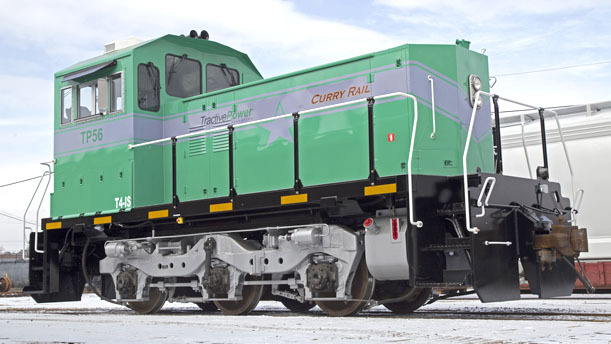 Tractive Power Corporation’s new TP56 Industrial Locomotive Switcher is now available for viewing. It is a fully customizable solution for the switching requirements of the industrial rail operator. The TP56 offers better overall tractive effort, lower maintenance, readily available components (off the shelf), greater fuel savings, and lower overall life cycle costs. It is simple... and it works is our motto. Contact us today to learn more about our locomotive and how it can assist you in your operations and achieve greater profitability. Affordable, lower maintenance costs, fuel efficient yet very robust and powerful. “IT IS SIMPLE … AND IT WORKS”. The TP56 offers better overall fuel efficiency & lower emissions than competing products. Built to last with lower overall maintenance. The TP56 provides plenty of tractive effort. Being part of the rail industry, we know the switching needs of the terminal operators. Tractive Power Corporation was founded in 2010 to provide innovative and practical solutions to the industrial rail industry. At Tractive Power, we have assembled a talented and committed team with significant rail industry expertise at both our Head Office in North Vancouver, BC and our manufacturing partner, Curry Rail Services in Hollidaysburg, PA, USA. Curry Rail is an AAR M-1003 and ISO-9001-2008 certified manufacturing facility that has strong working relationships with Class #1 railroads and many other short line rail industry partners. Tractive Power Corporation is an employee owned company dedicated to providing better solutions for industrial rail customers. Currently, our TP56's are manufactured by our manufacturing partner, Curry Rail Services in Hollidaysburg, Pennsylvania. Tractive Power Corporation is a manufacturing, design and engineering company for industrial rail products and technology solutions. Our initial product offering is the model TP56; an industrial switcher that offers better fuel savings, low maintenance, greater tractive effort with sufficient horsepower. Tractive Power Corporation was founded by a renowned rail industry innovator, Frank Donnelly. Through Frank and his team, the company’s mission is to provide innovative and practical solutions for the rail business. "It is Simple...and It Works!" Tractive Power Corporation was founded in 2010. With extensive knowledge and background in rail industry and technology, the company has much to offer the rail industry in terms of innovative and practical solutions. What Sets Us Apart Video Clip for 2018! Copyright © 2019 - Tractive Power Corporation. All rights reserved.